During the Presidential Campaign, I posed a question. 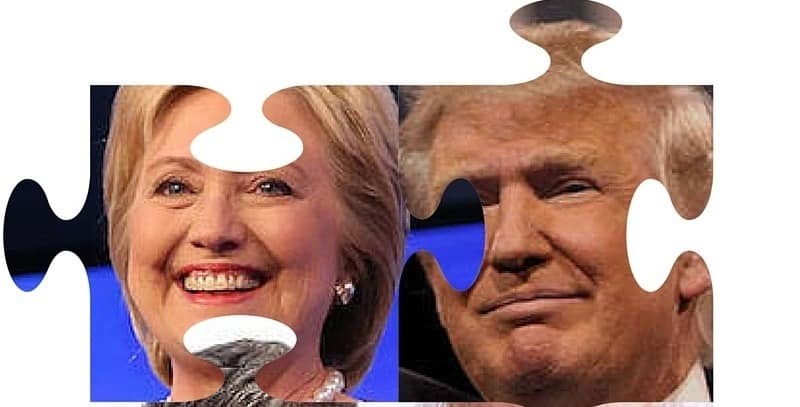 “Politics aside, what candidate would we hire in a hypothetical executive search for U.S. President?” The question is meant to viewed through a business lens, not partisan politics. It asks each of us to imagine being tasked with selecting the next President based on actual qualifications. Since then, We, the People, elected a candidate who, by any objective business measure, is wholly unqualified for the job. (See below.) I don’t know of a single CEO or board member who would ever have considered hiring Donald Trump into any executive-level role, much less that of Chief Executive of the United States. Not a one. Seasoned CEOs know full well that the cost of a bad executive hire is profound. Companies lose opportunities as they ignore mounting threats. Morale plummets. Employees jump ship (something American citizens cannot do). Revenues and profitability spiral downward until ultimately the underperforming leader is shown the door. Technically, We, the People, cannot fire President Trump. Consequently, the list of all the horrible things he’s done since becoming President continues to grow. Yet his popularity is waning. Business leaders who once supported him are speaking out. There are signs that the reckoning has begun. Donald Trump is perhaps best known for uttering the reality TV phrase, “You’re fired”. Yet his ineptitude is, in the minds of a growing number of business leaders, grounds for dismissal. Tesla CEO Elon Musk and Disney CEO Bob Iger quit as outside advisers following President Trump’s rejection of the Paris climate accords. Goldman Sachs CEO Lloyd Blankfein, GE CEO Jeff Immelt, Apple CEO Tim Cook, and other tech titans also have criticized the Paris decision. All told, more than 300 U.S. companies sent an open letter to President-elect Donald Trump urging him not to abandon the Paris climate agreement. The list includes Dannon, DuPont, eBay, Gap, General Mills, Hewlett Packard, Hilton, Intel, Kellogg, Levi Strauss, Mars, Monsanto, Nike, Patagonia, Staples, Starbucks, The Hartford, Tiffany and Vail Resorts and more. Yet President Trump did exactly the opposite. Trump’s immigrant ban has also alienated business leaders. Google, Apple, Facebook, and Amazon blasted Trump’s edict barring refugees from Syria and travelers from seven predominantly Muslim countries. Other businesses including Goldman Sachs, Morgan Stanley, Netflix, Nike, Lyft, and Starbucks pushed back as well. Netflix CEO tweeted that the ban was un-American. 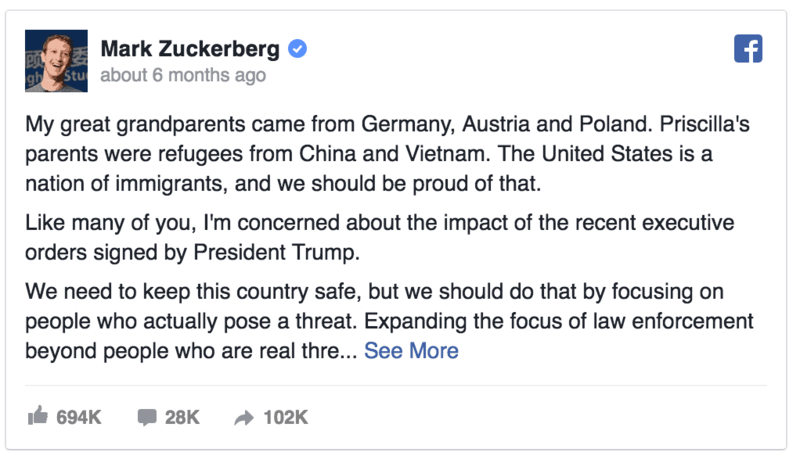 Mark Zuckerberg pointed out his grandparents were immigrants and his wife’s parents were refugees. The U.S. Constitution establishes citizenship and age requirements for the role of U.S. President. But that’s it. That means virtually any adult American with designs on the U.S. Presidency — including a convicted felon — can run for the highest office in the land. No college degree, no public service experience, and no leadership abilities are required. A position description for a corporate CEO would never set the bar so low. Yet that low threshold is precisely how Donald J. Trump became President. Had this been treated like an executive search for U.S. President, we would not be in this pickle. The executive recruiter would have written a candidate specification describing the ideal Presidential candidate. The candidate specification would be based on the work experience of former U.S. Presidents. Every single President has had a track record of experience in civil service or the military. In addition to building knowledge and competency, public service experience demonstrates that the candidate is actually interested in doing that kind of work. For those reasons, public service should be a requirement in an executive search for U.S. President. The critical thinking and analytical abilities cultivated by higher education are essential competencies in our increasingly complex world.A Bachelor’s degree should be a minimum requirement in an executive search for U.S. President. Because most of Presidents have been lawyers, a Juris Doctor (J.D.) would be preferred. The content of a candidate’s character would matter in an executive search for U.S. President. Recruiters seek leaders with exceptional character, values, and integrity. That is why executive recruiters verify credentials, check references, and eliminate any candidate who lies on a resume or is otherwise dishonest. Executive search partners develop performance profiles to determine what the executive would need to do to be considered a success. 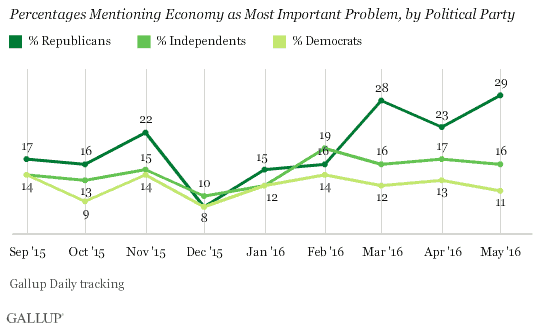 During the election, the one issue that concerned Americans the most was the Economy. In an executive search for U.S. Presidency, a candidate must have demonstrated fiscal competency. As Commander-in-Chief and as the externally-facing leader for our Nation to the rest of the world, foreign affairs expertise is preferred. It is not a must-have qualification because the majority of U.S. Presidents to date have not had foreign service experience. 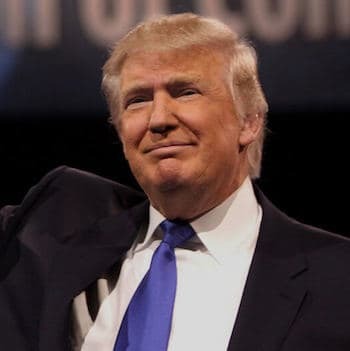 If the Presidential campaign were an executive search and if American voters were, in turn, executive recruiters, we would have eliminated Republican Donald Trump for failing to meet minimum qualifications mentioned above. Unlike every other U.S. President in the history of our Great Nation, Mr. Trump never served in public office until he was elected President. His life-long lack of interest in civil service has not only made Donald Trump unqualified for the role of U.S. President. It has made him incredibly unhappy in the role of President. Donald Trump did have the required college education — a Bachelor’s Degree in economics from the University of Pennsylvania’s Wharton School of Business, no less. Trump’s supporters have pointed to his business expertise as proof he of his fiscal competency. Yet, Trump drove his business into bankruptcy not once, but four separate times, a fact Trump does not dispute. If the above shortcomings were not disqualifying enough, Donald Trump would never have passed the most cursory background check in an executive search for U.S. President. His many scandals and his constant lying would disqualify him as a candidate for any executive job, not the least of which is that of President of the United States. John Oliver does a brilliant job deconstructing Trump’s lies. Though Democratic candidate Hillary Clinton offered the most impressive resume, she might not have made the cut either. She lacked an essential leadership skill of inspiring others to follow — something Democratic opponent Bernie Sanders had in spades. In other words, if we were tasked with recruiting the most qualified candidate for the job of U.S. President, we would have chosen someone better than the President we collectively elected: Donald J. Trump. 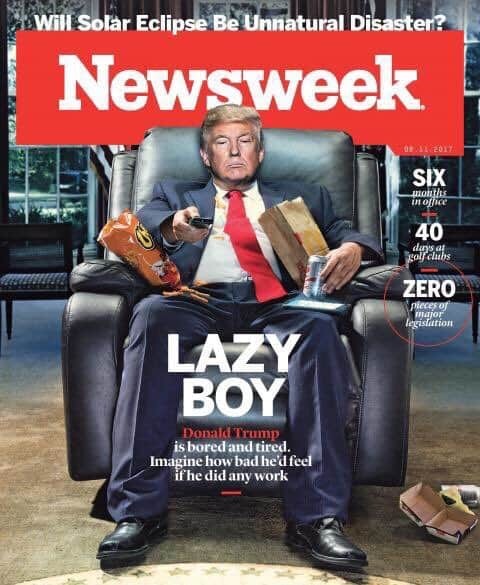 As the latest Newsweek cover below suggests, public support of the President has hit a nadir. Perhaps because Americans vote more with their hearts than their heads, Americans elected Donald J. Trump as President. Yet now it appears that We, the People, are learning a valuable lesson: the folly of hiring someone who is wholly unqualified for the job. The popularity of President Trump has plummetted since taking office. 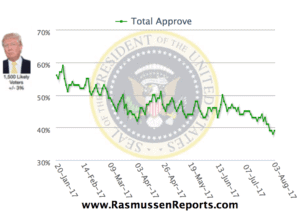 In Rasmussen’s Daily Presidential Tracking Poll, you can see our collective buyer’s remorse. We, the People, are experiencing the same kind of regret as the board of Apple after it made John Skully its CEO; as the board of HP after it selected Carly Fiorina (HP’s stock price dropped by 52 percent during her near six-year tenure as CEO); or as the board of Enron, which imploded under the leadership of Kenneth Lay (the CEO was later convicted of fraud and conspiracy in the giant energy company’s collapse).